ESP is very passionate about guitars. Since 1975, ESP has created numerous iconic guitars for legendary players spanning every genre of music. 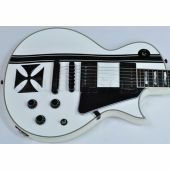 Their decades of experience in the design and manufacture of guitars and basses has allowed them to provide the very best options to us as players and music instrument stores. Every guitar that bears the ESP name undergoes a careful and rigorous process of quality control and craftsmanship that culminates in some of the finest instruments on the planet.